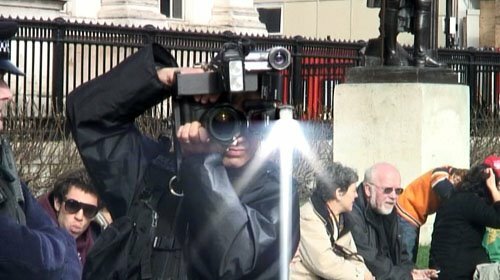 Street Journalism refers to those photographers, videographers and print journalists who spend most of their time on the streets scouring the latest issues, of which I am one. And Street Journalism includes covering a lot of political and social protest, of which there are plenty in London. But in recent months – that seems to have coincided with the introduction of the 2008 Counter Terrorism Act and subsequent publicity campaign – according to various work colleagues, it seems the London Metropolitan (Met) Police Forward Intelligence Teams (FIT), also known as Intelligence Gatherers – or the now infamous name of the FIT Squad – are taking particular interest in the Street Journalists. 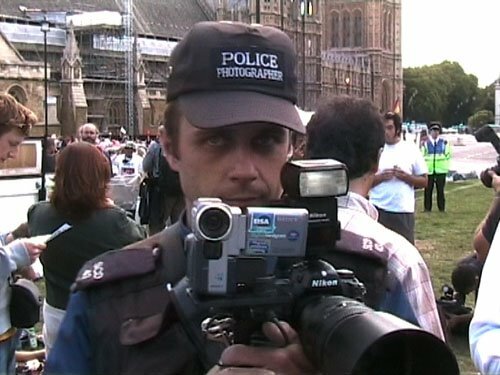 For myself, this comes as no surprise, simply because looking back through my three years of video archive, and my own experience, I find that I have been documented, filmed and photographed by the FIT squad since working for the Scottish Sunday Herald, alongside acclaimed investigative journalist Neil MacKay, at the 2005 Scottish G8 Summit, my first major gig as a journalist after graduating from the London School of Journalism. 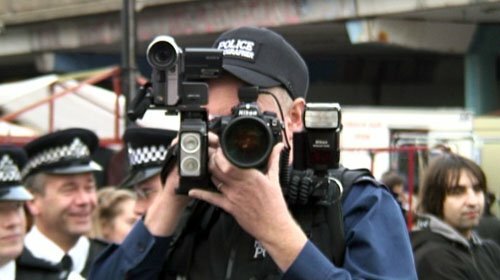 But now the issue of police surveillance and individual police attitudes against journalists has come to a head, with NUJ General Secretary Jeremy Dear addressing the issue and performing a”one person protest” outside Scotland Yard. 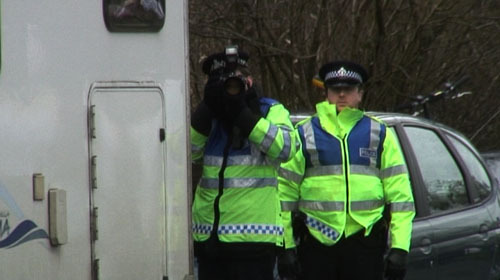 The video below was captured by myself at the 2006 Climate Camp in Selby, Yorkshire. 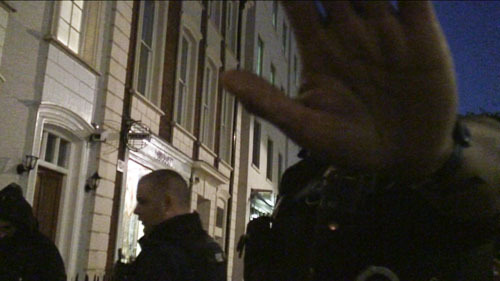 It documents a run-in with a Met FIT officer at the end of the first day of action. 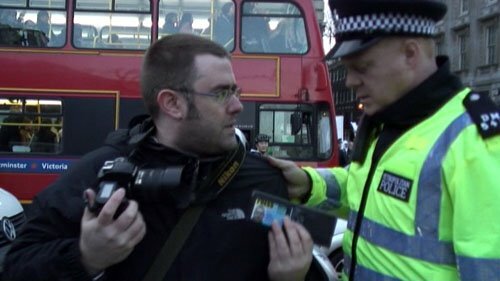 This incident came four months after a police officer accused me of having a fake press card and several months after media relation guidelines were agreed between the NUJ and the Met. The interesting thing here is the officer’s attitude towards NUJ freelance journalists, apparently with “ulterior” motives. But it is not only the FIT squad that I’ve had run-ins with. 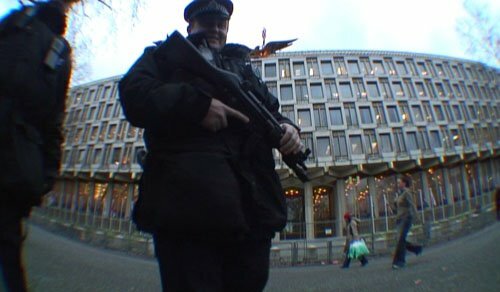 The image below, from January 2007, shows armed diplomatic police stopping me from filming shots of the front of the US Embassy. Depite showing an International Federation of Journalists (IFJ) Press Card – I had forgotten my NUJ card that day – having my identity verified, and explaining openly that I was taking a few incidental shots prior to the Amenesty International protest, I was told to leave a public area because, as the armed officer put it, they get nervous inside when you point cameras at them. This second video captured an incident when officers assigned to a FIT squad photographer took offence at my filming and threatened to have me removed from the area. This would have been hard to do, though, as I lived there at that time. 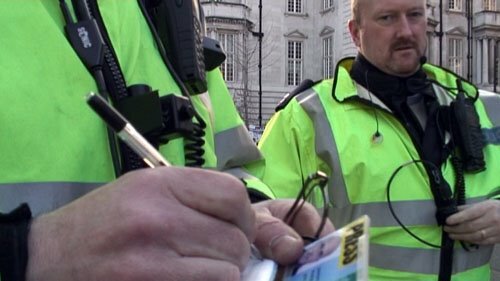 I do have to further mention, following this incident, I bumped into this officer (No 666) several days later, on the first day of protest against the 2007 DSEi weapons convention. We talked and he all but apologised for his behaviour, adding an English football fan had just thrown a bottle at his head, so he was somewhat annoyed. I acknowleged that, but added it still did not give him the right to come across so aggressive. 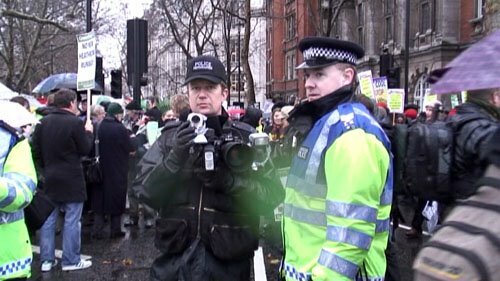 The image below shows another diplomatic police officer halting my filming whilst covering a small protest of six people, called to remember the anniversary of the murder of independent journalist Brad Will, at the Mexican Embassy in London, October 2007. Covering protest with known anarchist groups involved, no matter how peaceful they may be, these days, are certain to increase the police photographer interest. …but three times. 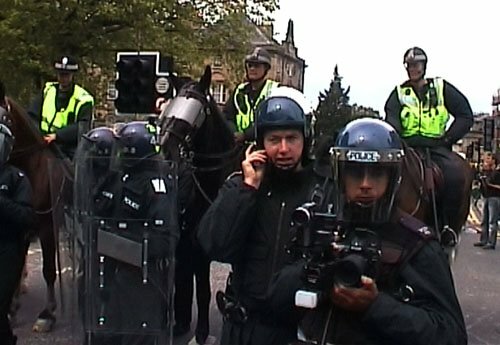 On top of that, that day, all journalists were kettled with protestors, I was physically forced into the police bubble by a high-ranking officer, and I was the last journalist to be allowed to leave the kettle. December 2007 saw the streets of a wet and sodden London fill with environmental protestors, marching for action against climate change. Environmental protests also seem to attract the keen attention of the FIT Squad. Janaury 2008 started with the Freedom of Assembly protest. At Downing Street protestors lay down in the street and the TSG riot police were brought in – minus helmets and shields. 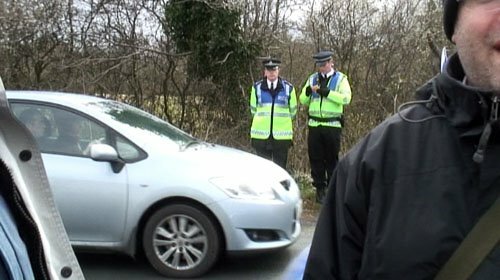 As arrests and some pretty brutal policing tactics were used , this officer decided it was time to move on the press, ordering us to the opposite side of the road. Several days later the police were protesting, over pay and the right to strike. The video below again caught an officer halting filming with the obligatory hand in front of the camera. The second Freedom of Assembly protest saw fewer protestors turn out, but a police presence that could no doubt have been labelled “over the top“. 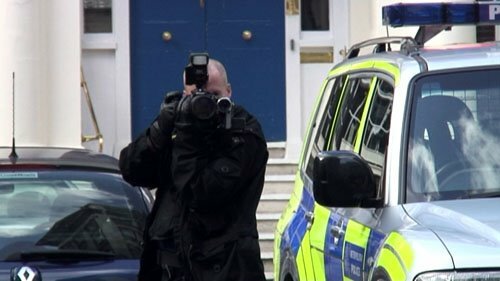 …then, following a group meeting between the note-takers and the photographers, the police photographers popped out from behind a white camper van and began taking photographs of our gaggle of working journalists. March 28 saw my good self back at the London US Embassy, covering a small protest demanding the release of Mumia Abu Jamal. You can guess the rest. But not only was I held for a stop and account – to verify that I was a working journalist, which they did – one officer then asked to see my video footage, to make sure I had not shot anything suspicious. This I refused. The list is now endless, in fact every time any of the Street Journalists seem to appear to work, so do the FIT Sqaud. 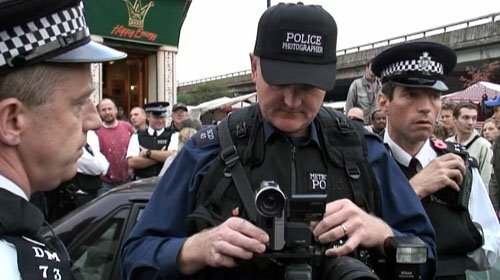 The above picture shows the FIT team documenting journalists who covered the National Front march in Eltham, London. The last video was filmed on May 2, again an anarchist-called protest at the GLA, against London Mayoral election.